Reaching out on to ISIS members via Telegram channels is a significant challenge for beginners. First of all, as the Telegram application is installed, the application copies all the contact numbers on one’s cell phone and connects the users with any of his contacts who are already registered with Telegram. However, to connect with ISIS members, channels, or groups, the key is knowing what channels are ISIS channels and what their names or addresses are. ISIS usually does not require verification for its public channels, therefore if one knows the name or address of an ISIS channel, joining those channels is simple—locate the channel and click the join button. As soon as one joins a channel all that channel’s posts are available to the new user. For peer-to-peer communication, however, the users must know each other’s registered phone numbers or user names. If a user is not originally recorded in one’s downloaded phone connections, in order to connect with that user over Telegram, one of the users has to provide the other his registered cell phone number. This process is useful for ISIS foreign fighters operating abroad as they often switch phones and need to reconnect with their emirs or middlemen and can easily do so even with a new burner phone, using their original login credentials. ISIS members may also open accounts before traveling and exchange those accounts beforehand so when they need to use them they can easily install Telegram on whatever device they are currently using and log into Telegram with their credentials to communicate with their ISIS peers. ISIS frequently posts on new and backup channels with different names for different purposes including: media and video sharing, book and journal sharing, news and daily updates, hisbah (morality police) office, accounts of personal well-known ISIS members, pamphlets and meme accounts, ISIS Amaq News Agency and several other channels or groups with different names. These lists are frequently shared on different social media platforms alerting users to subscribe to new or backup accounts in the case an account is closed or expected to be closed. While being banned and dropped in other social media mediums occurs to ISIS endorsers, supporters and distributors quite often, Telegram, as mentioned previously, does not frequently close ISIS accounts. However, the backup or spare ISIS channels usually function as a mirror of the original channel or simply are ready to be facilitated if an original channel is closed. 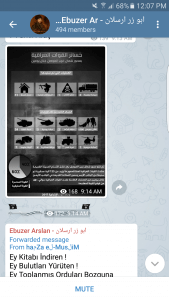 ISIS cross shares the lists of their Telegram channels as they appear and reappear via different social media accounts. For example, they post their new or existing Telegram channel addresses on Twitter or Facebook, and then in their Telegram channels, they provide their Twitter, Facebook or Instagram account names and encourage their members to follow those accounts as well to be updated of any changes when channels are taken down. In that manner, they efficiently migrate their followers from Telegram channel to channel. ISIS social media administrators also often share bulk ISIS Telegram account lists both in regular social media and also in their Telegram channels, by which users are alerted to join channels or follow individuals simply clicking the links of those accounts. If someone starts to follow an ISIS Telegram account, it is thus very easy to update and enrich their ISIS network of account collections and lists by simply subscribing to the post lists or by following the users who post to the groups and simply by looking at the forwarded posts and reaching to the original post owners with a few clicks. Therefore, following or communicating with ISIS Telegram accounts is an easy task as long as one understands how they work and basically keeps following the posts to update their related contact lists. Even if one completely loses ISIS Telegram channels on Telegram, it is still easy to reach out to those channels again by simply following ISIS related Twitter and Facebook accounts. ISIS users or administrators are not shy about their posts, and they are usually aware of the fact that many of their followers in the channels are not ISIS members, but are intelligence members or researchers. In fact, it happened several times with our ICSVE Twitter posts sharing some important incidents or updates from the ISIS Telegram channels we follow, that they would then openly post into the same channels saying “We know you are here and you are sharing our posts on your Twitter account. You are an infidel, and we don’t care if you are following us.” Strangely enough, ISIS administrators have never banned or blocked us from their channels thus far, perhaps enjoying the attention and being a threatening presence. Of course, there are strategies behind that as well. Simply put, the terrorist organization is using its Telegram channels to disseminate its propaganda and the narratives they would like to share, and they are aware of the fact that outsiders may be the ones who also become conduits for their shares to the outer world. There are countless channels and groups on Telegram, not only related to ISIS but also to other Salafist-jihadi terrorist organizations as well. If one does not know the specifics of different terrorist organizations, one would very easily confuse other Salafist terrorist organization’s channels with ISIS channels as they promote very similar thinking. While ISIS dominates the Telegram terrorism cyber-space, other groups use the same medium as well and just like ISIS, maintain groups and channels in different languages, probably more than twenty. One may witness a variety of things in ISIS channels. First of all, regular known ISIS channels or groups maintained by well-known recognized ISIS members such as Khilafah News, the Strangers, Mr. State, al-Firdaws English or Mr. Killer, share ISIS related breaking news, videos, memes, propaganda campaigns, brochures, new ISIS journals including Rumiyah and others, nasheeds, pictures or stories, or anything they would like to push. However, theme specific channels or groups only share related posts. For example, ISIS video channels would periodically post new or old ISIS videos in different resolutions or sizes, book channels would only post books or booklets mostly in pdf forms, news channels would only post news or news articles and so on. Therefore, based on the type of the channel or group, it is possible to reach and follow groups in different categories. Another important feature of Telegram is being able to search the channels posts, group messages, individual messages or any kind of communications or posts in one’s account. This feature is available for both cell phone applications and the Web-based Telegram interface making it possible to reach any content by simply searching. This basically makes Telegram one of the largest free ISIS databases available to the public especially considering the fact that many other mediums including Google, YouTube, Twitter and Facebook are continuously taking down ISIS posts. Telegram has enabled ISIS to create, without much effort, its grand propaganda machine to further its reach beyond it’s so-called “Caliphate” to the whole world with only the click of a button, pushing its new media content constantly and reaching to its targets momentarily, and most importantly communicating with its fighters abroad to direct them for new attacks or facilitate their operations in different countries. The nature of the Telegram application with a secure algorithm providing protection from the outside world and making it almost impossible, or very difficult, for law enforcement to trace back to the original users, also has become a magnificent advantage for the terrorist organization in terms of the anonymity of its users and for carrying out terrorist operations via secure communications. These two qualities are the most valuable qualifications, or gifts, for a terrorist organization like ISIS. Thanks to Telegram, ISIS has now been using their application very heavily almost without any interruptions with great success when compared to other social media applications. While other social media platforms have since 2014 taken strong stances to institute takedown policies when it comes to ISIS, the stand of the Telegram application when it comes to allowing ISIS to use its platform without interference is quite different and difficult to understand. Recently, Rob Wainwright, the director of Europol, European Union’s policing body, condemned Telegram owners for failing to join the fight against terrorism. Wainwright said that Telegram’s reluctance to work with anti-terrorist authorities was causing major problems considering the fact that the application is in widespread use among the target population of ISIS. Telegram has become the choice of the ISIS due to its specifications—providing secure encrypted communications and allowing users to share large files and act with their accounts operating with impunity. While Telegram administrators claim, they favor speech free of interference; it is time for the owners of Telegram to thoroughly consider the existence of ISIS presence and activities on their digital platform. Telegram has become the ultimate tool for the bloodiest terrorist organization in history, carrying and spreading its terrorist ideology around the world, recruiting and even directing cadres to carry out attacks globally. Recently, the families of the San Bernardino shooting sued Facebook, Google, and Twitter, claiming that these social media companies permitted ISIS to flourish on these social media platforms. It may soon happen that Telegram will also have to deal with several legal actions as ISIS cadres continue to utilize their application for their terror operations and communications. This article was originally published on the International Centre for the Study of Violent Extremism website on May 9, 2017. Republished here with the permission of the author.